Circa Infinity is one of those games that makes me wish I didn’t have to assign a numeric score. Its concept is interesting and the level designs keep the very simple basic concept moving along, but a lack of visual and audial change make the game a chore to play as opposed to a joy. Since game reviews are supposed to be about advising consumer purchases as opposed to encouraging enterprising indie game designs to keep trying, the only people I can see enjoying this game on a PC are indie arcade game hipsters who like simplicity and challenge. I think this game is better suited for mobile devices, where the repetition wouldn’t be seen as a bad thing. 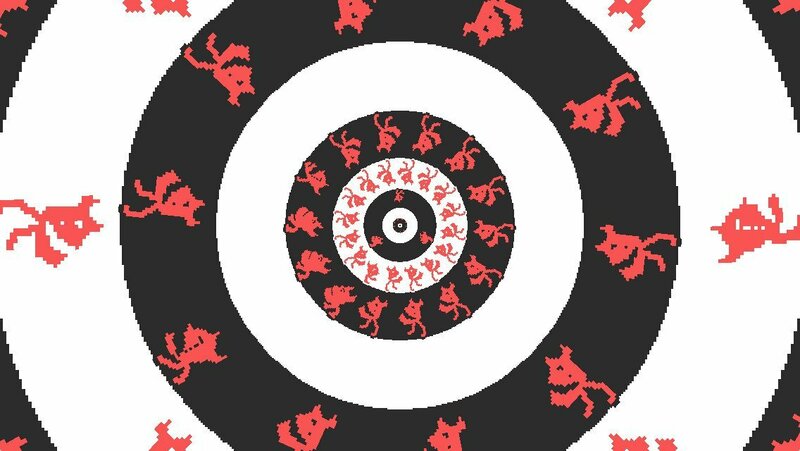 Circa Infinity‘s core concept is jumping and rolling to the centre of a set of concentric black and white rings, avoiding various sorts of red devil enemies. You avoid enemies on the outside of a ring by rolling past them, then you switch from the outside of a ring to the inside in a marked pie-shaped area. Then you can jump to the next ring and the process repeats itself. This wouldn’t be so bad if there were more aesthetic changes to keep players engaged. Colour or music changes would have helped so much to alleviate tedium. There seems to be no real curve to the difficulty, either. It spikes in funny places, lulls in others. On the bright side, you can’t really “die”—colliding with an enemy just sets you back a ring. The game logs these mistakes and the goal is to get down to none of them. I can’t even hope to do this on the more challenging levels, however, because I couldn’t adapt to the clockwise/counter clockwise controls and I kept going the wrong way despite myself. That being said, I actually liked the simplicity of the mechanics. The game just relied too much on simplicity and ended up feeling not quite ready to release. After ten levels you’ll get a boss fight, which are interesting, if frustrating, change-ups on the core concept. It’s still the familiar “three hits and the boss dies” format, but in this case, if you get hit, you have to start all over again. I enjoyed the boss fights despite the difficulty… or perhaps because of it. The heartbreaking thing is that if I had been given more sensory “meat” as I progressed, I wouldn’t have found the game nearly so boring. Even different coloured enemies would have been preferable. And ten game levels is a long time to be listening to the same music track. The music is actually really good; it just doesn’t change frequently enough. Therefore, it added to the monotony despite being worthwhile on its own. I also get that the black, white, and red colour scheme was deliberately minimal, but it didn’t give me enough sense that I was progressing and made the experience feel monotonous. Yes, there are different types of enemies that get added, but it wasn’t enough change to hold me. These are balance issues I feel prevent the game from being a truly ready-for-consumer product. Therefore, despite the things I liked about it, and despite clear talent displayed by creator Kenny Sun, I can’t really recommend it at the eleven dollar price point. For five bucks, I might have felt differently, but “retro” shouldn’t mean reductive, and Circa Infinity just doesn’t give you enough design to go with an extremely simple set of mechanics. Maybe Sun’s next game will aim to be more creatively ambitious, because technically, he knows what he’s doing. 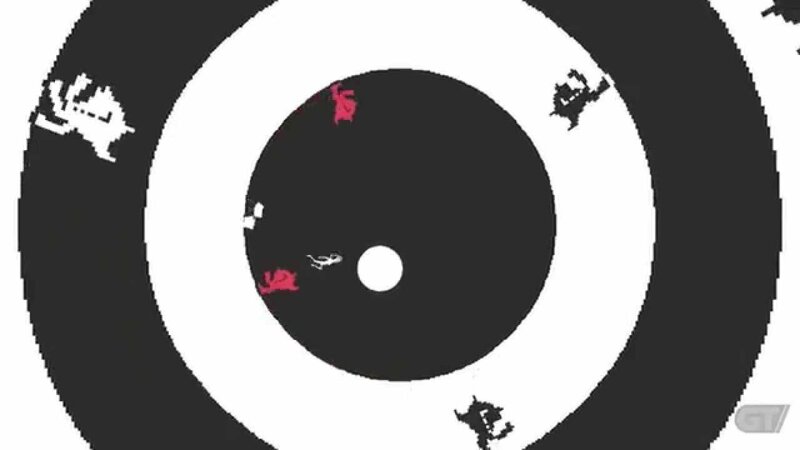 Circa Infinity's core concept is jumping and rolling to the centre of a set of concentric black and white rings, avoiding various sorts of red devil enemies.